Your little one will feel snug as can be wrapped in this plush throw blanket featuring their favorite movie, How to Train Your Dragon 3: The Hidden World. Their imagination will soar as they read their books all snuggled up in the throw and watch movies of adventures with mythological creatures. The front of this throw blanket features a fun and colorful scene with Toothless the dragon and his friends against a teal reptile pattern background. Great for on top of their bed or the couch, they’ll love cozying up to this soft and plush microfiber throw blanket. A quick way to add some fun and excitement to their bedroom décor, this How to Train Your Dragon throw blanket will make your little adventurer’s space feel extra special. 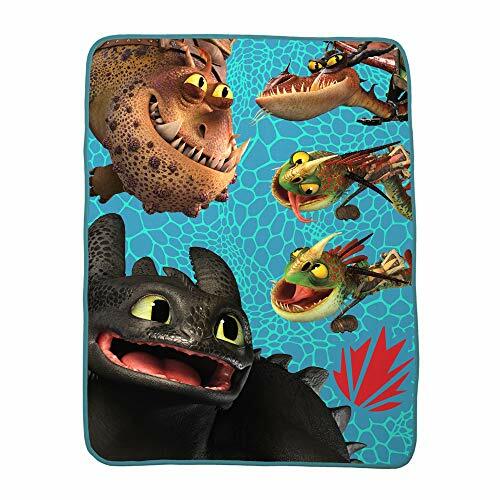 After a long day of adventure, your little thrill seeker will enjoy the comforts of their bed with this plush blanket featuring their favorite pair, Toothless and Hiccup. They’ll love seeing their bed decorated just like their favorite movie, How to Train Your Dragon 3: The Hidden World. 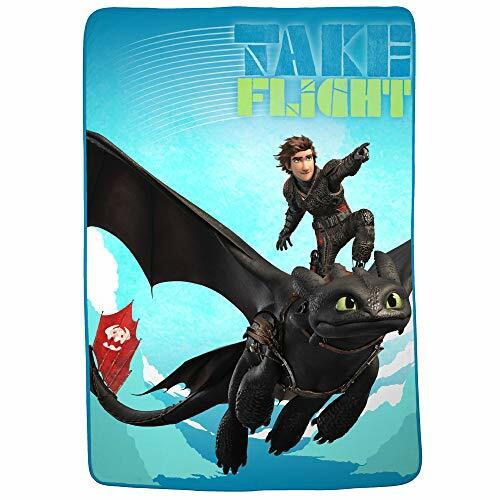 The blanket features a colorful print of Hiccup and Toothless flying through the air with the words ‘Take Flight’ at the top. Made from high-quality plush microfiber, your little dragon trainer will love cozying up to this extra soft blanket after a long journey. An easy way to add some fun and excitement to their bedroom décor, this How to Train Your Dragon blanket will make your little one’s space feel a little more special. With Toothless and Hiccup by their side every night, they’ll have the courage to dream big. After a long day of adventure, your little thrill seeker will appreciate the soft feel of this plush bedding set from How to Train Your Dragon 3: The Hidden World. The kids’ bedding set offers premium comfort that will lull your little one to sleep with its extra-soft microfiber material. 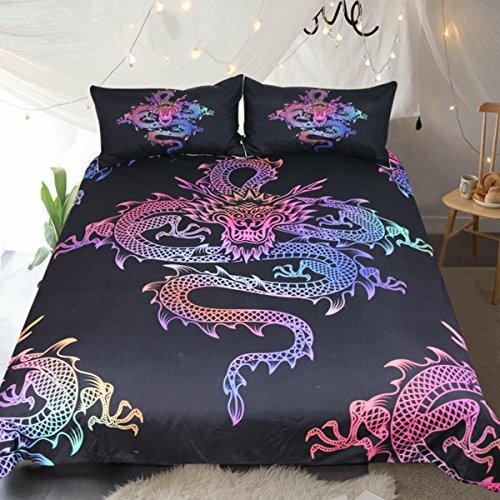 This bedding set includes a grey fitted sheet with an all-over print of all the dragons and a flat sheet with a teal background and a multicolor icon print. 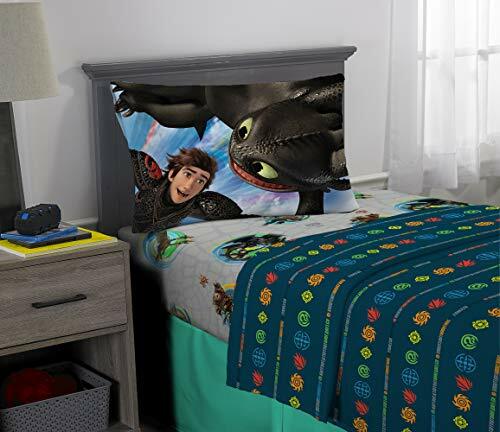 The set also includes a double-sided pillowcase with a character print of Hiccup and Toothless on one side and Alpha Toothless on the other side. 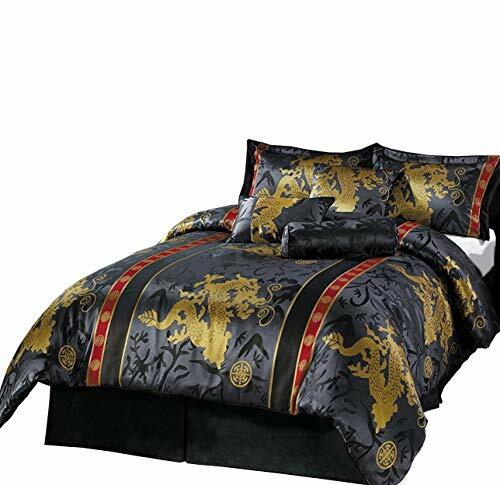 Package Includes:1 X Duvet cover(without comforter)2 X PillowcasesSize Details:3 Pcs Single size ( Twin )Duvet cover: 173 * 218cmPillow Cases: 51 * 66cm3 Pcs Double Size ( Full )Duvet cover: 203 * 228cmPillow Cases: 51 * 66cm3 Pcs King Size( Queen )Duvet cover: 228* 228cmPillow Cases: 51 * 91cm3 Pcs Super King Size ( King )Duvet Cover: 264 * 228cmPillow Cases: 51 * 91cm3 Pcs Double Size( UK Double )Duvet cover: 200 * 200cmPillow Cases: 48 * 74cm3 Pcs King Size( UK King )Duvet cover: 230* 220cmPillow Cases: 48 * 74cm3 Pcs Super King Size ( UK Superking )Duvet Cover: 260 * 220cmPillow Cases: 48 * 74cm3 Pcs Single size ( AU Single )Duvet Cover: 140 * 210cmPillow Cases: 48 * 74cm3 Pcs Double Size ( AU Double )Duvet Cover: 180 * 210cmPillow Cases: 48 * 74cm3 Pcs King Size ( AU Queen )Duvet Cover: 210 * 210cmPillow Cases: 48 * 74cmNote:1-3inch error is available,due to manual measurement.Color vary from different lightness,so please understand the real product maybe has some color difference as the picture displayed. Yu-Gi-Oh! 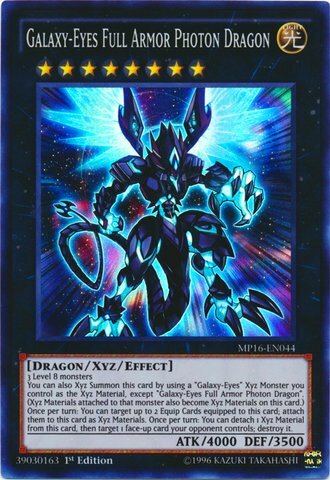 is a strategic trading card game in which two players Duel each other using a variety of Monster, Spell, and Trap Cards to defeat their opponent's monsters and be the first to drop the other's Life Points to 0.Card Name: Galaxy-Eyes Full Armor Photon DragonCard Type: Not AvailableCard Number: MP16-EN044Attribute: LIGHT Level: Not AvailableMonster Type: Dragon / Xyz / EffectPasscode: 39030163Card Text: 3 Level 8 monstersYou can also Xyz Summon this card by using a "Galaxy-Eyes" Xyz Monster you control as the Xyz Material, except "Galaxy-Eyes Full Armor Photon Dragon". (Xyz Materials attached to that monster also become Xyz Materials on this card.) 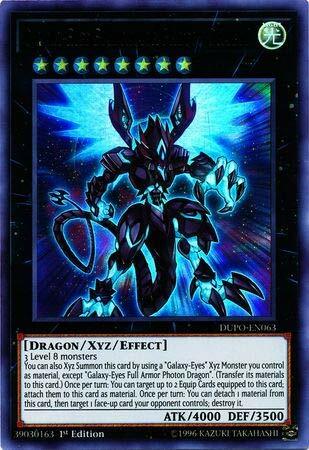 Once per turn: You can target up to 2 Equip Cards equipped to this card; attach them to this card as Xyz Materials. Once per turn: You can detach 1 Xyz Material from this card, then target 1 face-up card your opponent controls; destroy it. 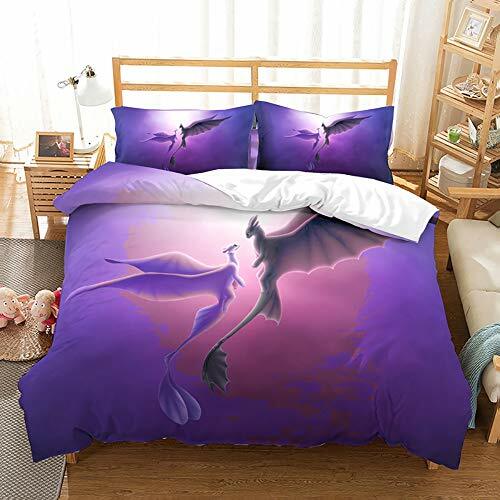 After a long day of adventure, your little thrill seeker will appreciate the soft feel of this cozy comforter full of fun character art from their favorite movie, How to Train Your Dragon 3: The Hidden World. The comforter delivers premium softness that will lull them to sleep with its cushiony microfiber material. The reversible design offers two exciting looks in one with a large character print of Hiccup with all the dragons flying on one side and an all-over graphic print of Toothless and Hiccup on the other side. 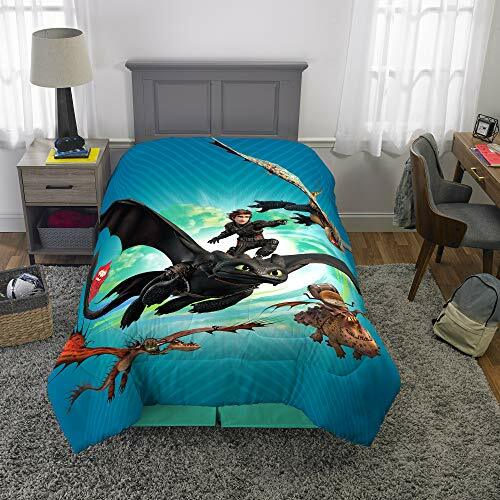 A great way to add a sense of adventure to their bedroom décor, this How to Train Your Dragon comforter blanket will make your little one’s room a place of fun and imagination. Shopping Results for "Full Dragon"